JBL on Tuesday announced a pair of speaker systems designed to support everything from MP3 players and laptops to desktops and home-entertainment centers. Both the JBL Duet II and JBL Duet III systems are designed to provide a clear, powerful sound while maintaining a small footprint. Both systems unveiled Tuesday incorporate onboard digital amplifier technology for delivery of high output with minimal distortion. 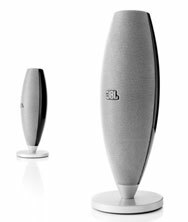 Each JBL Duet II speaker is 4 inches in diameter and 10 inches tall, while the slightly larger Duet III speakers are 4-5/8 inches by 12 inches. Both speaker systems are gray with silver accents; they’re compatible with computers, portable MP3 players, and devices that use a 3.5mm audio jack. Both systems are available in January. The JBL Duet II will sell for $100 while the JBL Duet III costs $150.